1.) Find a pickup game or adult league in your area. If it’s a pick up game, simply show up and introduce yourself. If it’s a flag football league near me, organize a team — pick the best flag football team name you can think of — or join as a free agent. 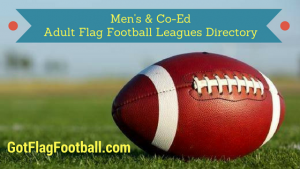 If you can’t locate either one in your area, learn how to start an adult flag football league or pickup group. 2.) Once you’ve got a game or league to participate in, check to see if they provide flag football gear. 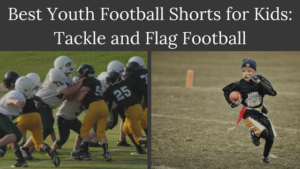 Specifically find out if they have the essential pieces of flag football equipment needed to play a game: flags or flag belts, cones and pinnies (optional). This can all be purchased as a full kit or set. Also, grab a pair of the best cleats for flag football that you can find, as cleats help you run fast and avoid injury by maintaining grip. Other important individual items include: a mouth guard, shorts with no pockets, football gloves, athletic tape and a padded helmet for flag football (optional). 3.) Study the rulebook or style of play amongst your pickup group. Make sure you understand how the game will be officiated so that you are limiting any unnecessary penalties. If you’re simply joining a pickup game, be sure to ask other players you meet what the rules of the game will be. It’s important to note that not one strict set of rules exists, nor there only one format for playing flag football. 4.) Show up a little early to introduce yourself and warm up. If the game starts at 9am, show up a little early to help set up the field with cones and pylons, if you’re joining a recreational pickup game. In an organized league, the flag football field will be set up for you. Make sure to stretch and get loose to avoid injury. Go over any advance gameplans with your teammates. 5.) Know your flag football position and form a gameplan. Assess your own skills and interests before getting in the game. Every player on the field must have a position and that position involves a specific purpose within the team. Figuring this out will help you and your teammates know what everyone is expected to do on offense and defense, which will go a long way in helping you and your team gameplan for how to win flag football championships. 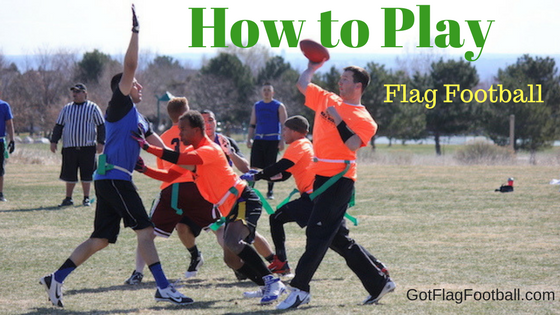 Flag football playbooks are helpful in league play, but are optional, especially in a recreational format. In essence, knowing what to do as a team, or offensive or defensive unit is equal to a gameplan, which is vital whether or not you have a set playbook. 6.) Communicate with other players on the field. 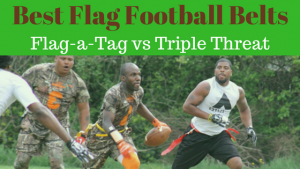 Flag football, just like tackle football, is the ultimate team game! You cannot play the game of flag football alone. Point out helpful reads or tips to your teammates, if you’re an experienced player. Ask questions to the team captain or coach in an organized league, if you aren’t sure of your assignment. 7.) Be aware of the game-clock or the points total, at all times. Most pickup games are played on a point system, without the structure of keeping time. In league play, there will most definitely be pre-defined length of the game. Understanding this in advance will help make you more aware of scenarios you are more likely to face by the opponent in that instance. 8.) Play hard and focus throughout the whole game. The game is a lot of fun to play when everyone on the team is fully engaged. It doesn’t have to be the most intense or competitive style of play, but if everyone gives their best through the entire game, you contribute to a sense of camaraderie amongst your team that is the foundation of any team sport. If you want to understand how to be good at flag football, simply playing your hardest and never taking a play off, so to speak, goes a long way towards improving your game. 9.) Enjoy yourself and make friends. Unless you are playing in an intense tournament, it’s important to remember that you aren’t playing a professional sport. Ultimately, even at the most competitive level of flag football, if you aren’t friends with or at least friendly with your teammates, your team will lack the chemistry necessary to excel. If you’re looking to be a regular at your local pickup game, why not enjoy the time you spend and look to make some friends while playing the sport of flag football? The most direct route to fully defining the sport of flag football is to compare it to American tackle football. 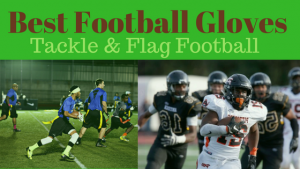 Flag football is a version of the game of US tackle football, played as a sport by men, women and youth flag football league participants, with many similarities and a few distinct differences. The end goal in a game of flag football, as in tackle football, is to score more points than the opposing team within a certain period of time (as in an organized league game of flag football) or to reach a certain point total (in an informal recreational style of play), thereby winning the game. For starters, of course, the main piece of gear needed are flag football belts and flags. Cones, field markers and pylons are necessary to prepare the field of play. Most of these items are available in the best flag football kits on the market. 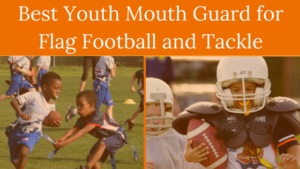 Additionally, both recommended and optional individual player flag football gear commonly used to participate in the game, including football cleats, mouth guards, football gloves, athletic tapes, pinnies and mouth guards may also be utilized by players in tackle football. Both sports feature the same or similar types of football to be utilized in the forward pass or handoff, which vary in size and weight depending on the age and experience level of the players. Padded flag football helmets are also starting to become a trend, as now players are more aware than ever of the potential risks of concussion in any sport that involves even incidental contact. Another main point of contrast between flag football and tackle football is in fact the level of contact that is allowed to occur between two opposing players, during a live play. In a game of full contact tackle football, in order to end forward progress of the offense, a defender must stop the ball carrying offensive player by tackling the ball carrier to ground, or by dislodging the ball and forcing the advancing offensive ball carrier to fumble. In the sport of flag football, however, tackling is strictly prohibited. Therefore, the only way for a defender to end a play is by pulling the flag or removing the entire flag football belt of the ball carrier, while that offensive player attempts to progress towards first down marker, en route to the end zone in order to score points and win the game. Although tackling is never permitted in any format of flag football, some level of contact is often allowed, and to some degree, is unavoidable. Players align themselves in a formation on offense before the ball is hiked, in order to achieve the offensive objective of the game, which is to advance the ball into the end zone and score points; while on defense, defensemen position themselves in order to deny the offense as whole, as well as the individual ball carrier, the ability to progress the ball. Inherently, with defensive players converging on the ball and non-ball carrying offensive players attempting to downfield block (if rules permit), there will be times when players intentionally or incidentally come in contact with one another. As in tackle football, the game of flag football is played with both an offense and a defense present on the flag football field during a live play. The objective of a recreational or competitive game of flag football is for the offensive players as a unit, along with the individual ball carrier, to advance the football across the goal line of the end zone, thereby scoring a touchdown (always worth 6 points, with an additional 1, 2 or 3 point attempted conversion after the score). Offenses have a minimum of four attempted plays to either gain a first down, continuing the drive to the end zone, score or else elect to “punt” the ball to end their drive. The defenses goal, then, is to stop the offense in as few plays as possible. This can be accomplished by pulling the ball carrier’s flag on each consecutive play, prior to the offense crossing the first down marker or the goal line. The flag pull can occur beyond the line of scrimmage or behind the LOS. If the ball carrier’s flags are pulled behind the LOS, the result of the play is a loss of yards, either due to a quarterback “sack” or a run or pass play that did not advance. The defense may also end the offensive drive by generating a turnover by intercepting a forward pass. There are no fumbles in flag football, as any ball that touches the field is considered a “dead ball”, which ends that play. Whereas in tackle football there are 11 players occupying the field on both defense and offense, in a game of flag football the maximum number of players on offense and defense at any given time are usually does not exceed 9 at most and 4 at the least. 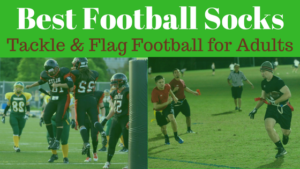 Typically, the flag football field dimensions and the rules of the organized league, or recreational pickup game, determine the maximum or minimum capacity of players on the field at any one time. Unlike tackle football, where the concept of a pickup game is uncommon, flag football is a game that can be more informal in nature. Pickup flag football, a recreational version of the sports, is played in cities and towns across the globe, throughout the year, in a less rule-oriented manner, where there are less stringent rules about how many players are needed in order to participate. These games are often played without referees and are self-officiated, meaning that, unless the result of the play is clear-cut, players on offense and defense come to an agreeable conclusion in order to begin a new play and continue progressing in the game. Forming a team, or being acquired by a pre-existing team as a flag football free agent, and competing in an organized adult flag football league provides more structure to the game. Often teams involved in a league style of play will hold flag football practice and run routes and flag football drills in order to condition and get in shape for a more advanced level of competition that they will face in league play. Adult flag football leagues typically create and define the rules of their version of a flag football game, which is governed by that particular league, and is upheld by anywhere from one to four on field referees during live play. League games are played with a running time clock, which keeps the flow of the game at a steadier pace and usually increases the level of competition and the speed at which the game is played. Adult flag football leagues often facilitate competition by providing premium field conditions, optimal lighting, the best flag football gear and awards that go to the top ranked team in the league. In the most competitive leagues, it is common that, in addition to tallying team wins and losses, stats are tracked individually and players are recognized for the on-field accolades. Professional photography and videography of in-game action is also a premium feature of some of the top leagues in the country. Most organized leagues require some form of payment from teams (typically $500 or more) or free agent players (approximately $50 or more) in order to cover their costs of providing services and ensuring player safety and insurance liability. It’s important to note that there is not one single set of rules in the sport of flag football. This is one aspect of defining the game of flag football that few other websites accurately cover. Much of the information available regarding rules state the specific rules of a particular league or pickup game. In essence, it’s nearly impossible to outline all of the potential rules of flag football as there are too many variations to cover. Each player must have a flag football belt securely fastened to the waist area at all times. If there are 3 flags on the belt, one must be located on the each hip and one down the back. If there are 2 flags, one must be placed on each hip. Stiff arming, or “flag guarding”, meaning to block a defenseman’s attempt to pull the ball carrier’s flags, is not permitted. Impeding an offensive players path is not allowed; defensive players can “square up” to a offensive ball carrier in order to pull their flags, but they can not physically block them. Leaving the feet in order to jump over a player on defense is not allowed; leaving the feet is only allowed if the ball carrier is attempting to avoid a possible collision with another player. Spinning to avoid a flag pull, or avoid contact, is always legal. Backwards passes behind the line of scrimmage are allowed; only one forward pass is allowed. For example, in certain formats of adult flag football, contact is encouraged at the line of scrimmage. In other leagues or pickup style games, no contact is allowed. Under some sets of flag football rules, the ball is marked down at the spot of the ball carriers feet; in other league rulebooks the ball carrying player may extend their reach to gain extra yards. Again in other leagues, offensive players may not leave their feet, as this will result in a penalty and loss of yards. Then again in other leagues, jumping is fully permitted. In regards to contact, if contact is permitted, defensive players attempting to cross the point at which the ball was snapped, in order to pull the flag of the quarterback or ball carrier and end the play, may be met with by an offensive player or players who are attempting to prevent the defenseman’s progress. In leagues or games that allow blocking, it is typically allowed at chest level only; diving at or “chopping” below the waist or jumping over another player is considered an illegal moved and is subject to penalty. Another unique aspect of flag football involving the players along the offensive line is the concept of the eligible receiver. 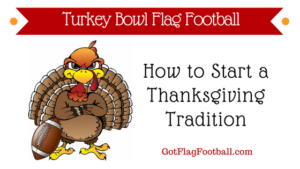 In the most popular formats of flag football, all offensive lineman are treated the same as a wide receiver, running back or tight end in that they are entitled to catch a forward pass that is thrown, or “shoveled” from behind the line of scrimmage. This variation deviates from the rules of traditional American football and drastically increases the options of available flag football offensive plays in a team’s flag football playbook that a team may deploy. In terms of the number of available offensive players to distribute the ball to, the fact that the offensive lineman are eligible receivers in flag football (and potential TD scorers), the number of possible ball carriers that the defense must cover increases; this in turn encourages various combinations of offensive and defensive options in formation and coverage, regarding adult flag football strategy. Although the offensive line in flag football has more versatility and scoring power than in tackle football, flag football players occupy positions on the field of play that are also very similar to those that compose a tackle football team. Flag football has evolved into one of the faster growing sports in the world. This is due to the fact that a game can be played with four or more player per team, minimal flag football equipment and an adaptable set of rules. Ultimately, flag football provides a means for men, women and children to stay physically active and enjoy the camaraderie and social quality of playing a team oriented sport, at nearly any age in life.